A good egg is one that has a yoke bordering on orange, on strong orange. It is not a pastel yellow. A good egg has heft and weft and will make your mouth water when prepared properly. It can be from any particular fowl, but if you don’t like to feel or interact with your food, then you should just stick with chicken eggs. 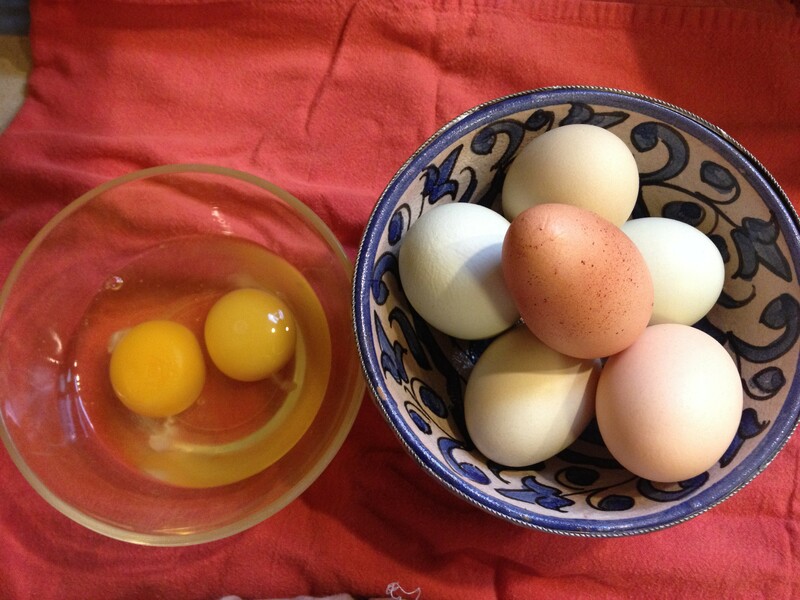 I only get eggs from friends, my local farm-share or I buy the ones that I know are free range and allowed to roam. This means they are more expensive, a real meal in a small container. If I cannot get good eggs, I don’t bother eating eggs in the following way. I only recommend this recipe with a GOOD egg. This recipe is for ONE person, just increase amounts of stuff if you are doing this for a friend. Slice an onion in half and cut the half into thin slices. Sauté it up in butter* until the onion is soft. Throw in a few leaves of fresh basil or parsley or tarragon and only sauté for ten seconds. Put more butter in your pan if you need to. Move the onions over to the side of your frying pa and then crack your egg or eggs over the butter. Cook them either over–easy (how I like mine) or over hard (how Kevin likes his). Sprinkle some good salt and pepper on top of your egg. Toast up a piece of really good rye bread, the dark stuff or some other favorite bread or a half a baguette. * Spread white goat cheese or cream cheese on the bread and put one chipotle chile over this and spread it all around. You can buy canned chipotle chilies in most stores if you aren’t the home chile canning kind of person. These are smoky flavored spicy peppers. If you aren’t a pepper lover, omit the chipotle. My parsley sauce or my pesto also work well if you don’t want the chipotle flavor. Place your cooked egg on the bread, put the onions and the basil over it and enjoy with your hands. This is a messy egg, a yolk spilling over the onions and bread and your fingers kind of egg. It’s an egg I engage with my whole being and I feel it in my blood and in my tummy saying yummy, yummy, yummy! The Good Egg, with onions, goat cheese and chipotle peppers, gooey, messy and perfect! *Dairy-free option is to omit the cream-cheese or goat cheese and instead of frying in butter use olive oil for onion and egg cooking. Gluten-free option is to omit the bread. 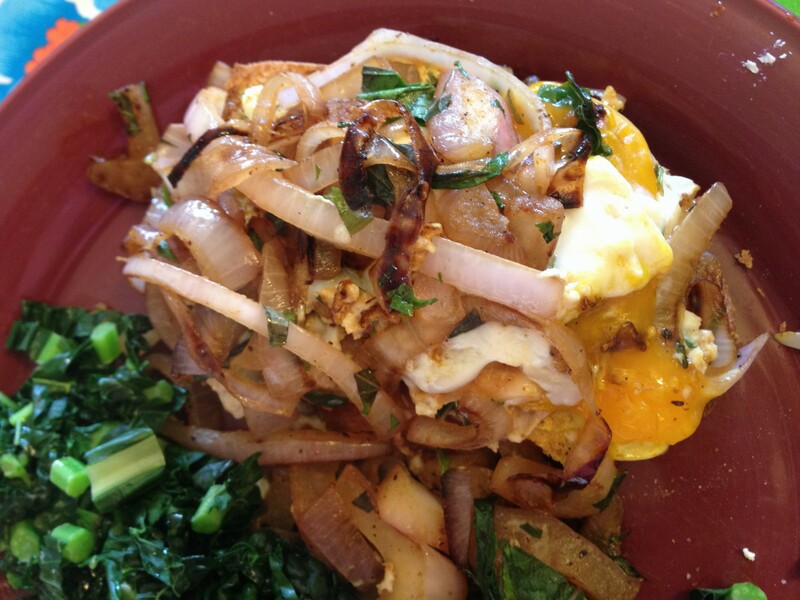 I love this egg with fresh kale, so you can make the sloppy mess and put it over your lightly sautéed kale.